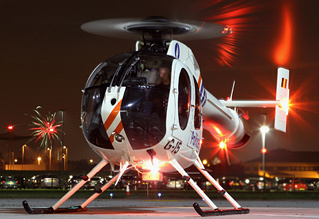 Now a staple of the enthusiast's calendar, the biannual night-time photo shoots at RAF Northolt bookend the airshow season. The format should be familiar by now, even to those that have never attended; as the nights draw in and winter approaches, a selection of aircraft are displayed in the glow of the dispersal lights, allowing enthusiasts the opportunity to photograph operational aircraft in a unique setting. The Northolt shoots have produced some gems over the years, but the author had never been able to attend previously for one reason or another. Nightshoot XXIII saw the opportunity to finally put that right. Despite reading reviews from regular attendees, there can be no substitute to sampling an event yourself. Craig Scott provides his view on this event as a first-time visitor. Photography by the author and the UKAR Staff Team. The day had begun ominously; the weather leaving Yorkshire was horrendous. Whilst not as limiting for a ground-based photoshoot as a bad weather would be with an airshow proper, the evening forecast of rain was a concern for both photographers and their cameras alike. Fortunately we needn't have worried, as whilst the rain did eventually set in towards the end of the evening, the engine runs had already taken place by then and most enthusiasts were content to venture off a little early. Unfortunately the unfavourable conditions certainly played a part in the cancellation of the L-19E "Bird Dog" and possibly in the cancellation of the event's star item, the HeliOperations Sea King. The event was lucky to avoid the horrendous conditions that could have easily occurred however. As with any event taking place on an active base, security is taken seriously. Cars had to arrive on-time, neither early nor late. This made for an interesting driving experience battling through the rush hour London traffic to arrive at the station ready for arrival. It's difficult to see an alternative to this situation but it was a welcome relief to arrive at the allocated crash gate and park up on base. Registration was taken and all cars and enthusiasts were given the once over by RAF Police sniffer dogs. This seemed a sensible and proportionate precaution which was met with good humour by all enthusiasts present. A short safety and etiquette brief followed and it was here the event showed its pedigree. Night shoots I have previously attended felt more relaxed and informal - Northolt is different as there are definite protocols to be followed. Partly this is through necessity; flash guns can be a hazard to aircraft operations, particularly for NVG equipped aircraft, and their banning was very much required as a safety measure. The upside is that the ban also allows attendees to use long exposures without pointless flash interuptions. On heading over to the flightline a few things are apparent to the first time visitor. Firstly, that the right hand end of the flightline is rather dark, validating comments made in previous reviews by seasoned event veterans. The RAF Hawk parked there was extremely difficult to photograph given it is a black aircraft parked in shadow. 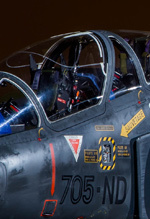 The solution to this is difficult, and under the circumstances it made sense for the Hawk to be placed there allowing the centre of the flightline to be dedicated to some of the rarer participants. Portable lighting would potentially be an answer here, but given the small scale, volunteer led nature of the event it is perfectly understandable that this was not available. What was perhaps more surprising on this occasion was the lack of presence from the Royal Air Force. It was somewhat bemusing to see no 32 Squadron presence with RAF attendance limited to a single Hawk and Tucano. Operational needs of course take precedence and other visitors from other organisations made up the shortfall, but this lack of support was disappointing. 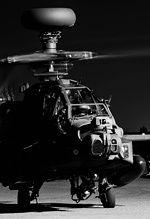 This should not detract however from the highlights of the event, particularly the Belgian Police Force's MD520, the Army Air Corp's Apache AH.1 and Lynx AH.9. The Lynx AH.9 has never been a particularly common sight and this one with its machine gun mount fitted was particularly welcome given the type's imminent departure from service. 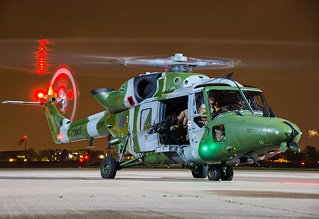 As a surprise addition this really was appreciated by the enthusiasts on the night and went a long way towards replacing the Sea King as a star item. On this note it was pleasing to see that the behaviour and courtesy exhibited by fellow enthusiasts was exemplary; there is always a concern that lack of thought for others can result in friction. It was pleasing that none of this was witnessed, as everyone was generally aware of others in their vicinity and tried to be as accommodating as possible. For their part, the volunteer staff were excellent hosts - polite, friendly and helpful is all you can ask for. Thanks and congratulations should be extended to all of them. The event continues to represent excellent value for money and there is no doubt it could not happen without a hard working and dedicated team. Overall, the cancellation of the Sea King means this will probably not be remembered as the nightshoot's finest hour, though no fault for that can be attributed to the organisers. There was still enough content there to more than justify braving the nightmare London traffic and to keep the weary enthusiast content.